Part Minecraft, part Orcs Must Die, and guided by the hands that crafted Gears of War, Fortnite is a hodgepodge of various game genres and mechanics, which is appropriate considering that this is a game about collecting whatever you can find in the world, and throwing it all together to create your very own fortress. 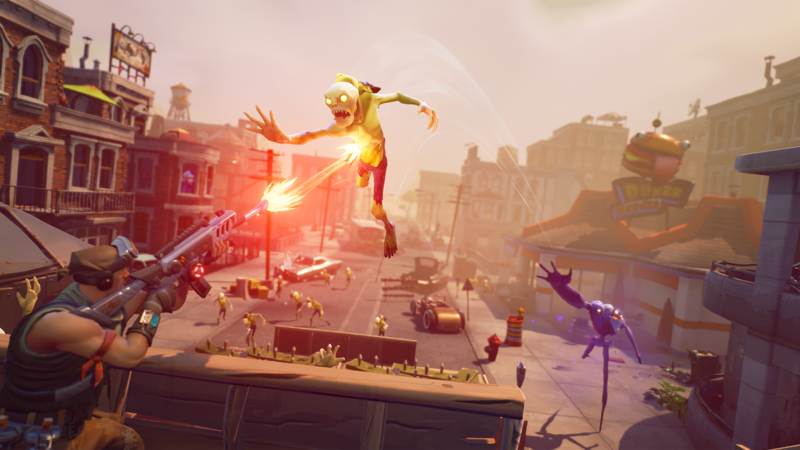 Our own Editor-In-Chief, Joshua Vanderwall, already wrote up a lengthy preview for Fortnite back in July of last year, so I'd highly recommend reading that first for a primer of what Fortnite is all about. In a nutshell, Fortnite is a tower defense game with a heavy emphasis on creative base building and survival mechanics. Each map in Fortnite begins with players setting out to forage for supplies. In typical Minecraft fashion, this is done by smacking trees, fences, walls, cars, garbage cans, or anything else in the environment until it breaks down and gives you its materials. There's even a minigame involved with collecting supplies that places a weakpoint on whatever item you're hitting. Hitting the weak point does extra damage and randomly spawns another weakpoint in the same vicinity on the object. It's actually a pretty ingenious mechanic that not only makes it more engaging to do an otherwise boring and menial task, but it adds on some extra pressure when you're trying to quickly collect materials when in the middle of a defense. It's almost staggering just how many different types of resources there are to collect in any procedurally generated level of Fortnite. Every house can be broken into and literally torn apart in search of valuable tools and metals. Some levels might have caves that not only hide precious minerals, which are invaluable in crafting high level items, but are also likely to contain treasure chests with blueprints that allow you to craft newer and better weapons and traps. Ultimately though, the main goal of this first phase of Fortnite is to find all of the gates in a level and start building forts around them in order to protect against the incoming horde of husks. This was the part that I was most worried about coming into Fortnite, because if there's one thing I'm awful at in video games, it's building things using creative tools. Fortunately, the building UI in Fortnite is surprisingly intuitive and within a few minutes I was making multi-storied forts with choke points, sniper perches, trap laden hallways, and easy entry and exit points for the team to use in case things turned south. One touch that I really like is the ability to edit walls and easily add windows or doors without having to dig through menus and sub-menus. By simply walking up to a wall and pressing the edit button, a 3x3 grid will overlay the wall and give you the option to select and punch out a specific square. Punch out a single square and it will turn it into a window, but if you punch out two squares in the shape of a door, it will start making a door that only you and your allies can open. Similarly, if you want to make a balcony or a narrow walkway, all you have to do is place a 2x2 floor, and then go into edit mode and take out the blocks that you don't need. It's all very simple, very intuitive, and most importantly, it can be done quickly without interrupting the flow of the game. Once you think your fort is ready, you can then activate the Atlas device surrounding the gate to unleash the husks. You can't just leave everything up to your base defenses though. You'll also have to get into the action yourself using a variety of melee and ranged weapons that you can craft for yourself. It's a delicate balancing act that you must play, since you often will use the same resources for crafting weapons and ammo that you use for your defenses. In my hands-on time with the game, I played two levels. The first level was mostly a tutorial and I honestly felt more compelled to explore for more chests than defend my base since my traps were killing everything. It was in the second level, though, that my eyes were opened as to how much fun Fortnite could be. This time we had to defend three gates, all at the same time, against waves of much more intelligent and varied enemies. Some were gigantic boss enemies that required us all to focus fire in order to bring them down, others would throw enemies over our walls to either break down our ceilings, or land right inside our fort if we happened to neglect making a ceiling. It was a grueling defense; one that we would eventually fail due to enemies breaking down the weak wooden walls surrounding one of our gates. But it was in that failure that I realized how much fun this would be with a well coordinated group of friends, each in charge of their own gate, calling out to each other when we needed help, requesting supplies when one runs low, and so on.